Discussion in 'Vegas Trip Reports' started by jgates8, Apr 14, 2019. Good stuff so far! Congrats on the 9 ladies club! I always feel "home" when I get to Paris also! Sad that they are removing the older games....loved playing and grinding out the TCs! Hope you feel better today! Awesome report, good thing you have that glucose monitor. Keep it coming. Enjoying your trip report so far! Loved the dolphin pictures! Looks like you've gotten a few big wins so far - congrats!! Fantastic report---love the details. I had the same issue as you with the shared limo. Last year I waited 45 minutes cause no available limos. Finally, I jumped on 1 of their shuttles. I cancelled the return trip, too. Received a full refund. I'm hesitant to use them, again. Never had this issue with previous bookings. Love the trip report @jgates8 ! I hope the residual work stress has been sucked into the Vegas vortex of happyland for you! Love the pics and the great report, and I hope you have a stellar rest of your trip! If you looked at my trip dates, you know that part of this week encompasses a massive storm moving through the upper midwest. My daughter was to fly to Phoenix for a bachelorette party on Thursday from MSP on SW. Meanwhile my return flight was Thursday into MSP on Delta. Sunday night she happened to look at the weather when I brought it up and of course began to freak. She was trying to change her flight to Wednesday however the pricing was insane. Turns out she then did receive notification from SW that flight could be changed. She luckily changed it to a Wednesday 5:30(?) pm flight and left work half way through to get herself up there before the snow started. Her flight left late and only a few minutes to get gate to gate but through Kansas City (smaller venue). No time to even grab a sammie - and one lady on the flight could not run so she gave my daughter her name to tell the gate agent she was coming. (They had 8 going to that flight so I expect they'd have given them all a couple of minutes in a smaller airport like that). Her original flight on Thursday was cancelled. I was starting to wonder why I had no notification from Delta so Tuesday night around 11:30 I finally went to the website on my phone vs. the app. On there it finally had a banner showing that adjustments could be made. I spent 1.5 hrs on the phone with Delta (didn't want to screw it up on my phone when I was that tired) and changed to the same flight on Friday. While I was listening to 'hold', I called downstairs to the desk and asked about adding another night. Website (not logged in) said $274 for Thursday night. Live person said $190 but to check with the host in the morning & I would have to change rooms. (Remember I had booked 5 free nights). OK, for that I might just blow off Paris and go to Ellis Island which I believe showed up around $70 for Thursday. She did hold that room for me. In the morning I went down to Diamond check-in and they offered the room with no room change for $90. That I can live with!!! I was hoping to get it comped at the end. I didn't check to see if my flight on Thursday was cancelled but likely it was. I called Groome & changed my shuttle from MSP to Eau Claire to Friday and my VIP shuttle to the airport to Friday. Check - Check -Check - everything covered! In later conversations with my husband we received 12 inches of snow followed by hours of freezing sleet on top of it. Basically it turned into cement in our driveway and he could barely get in and out with the 4WD. He told me I would not even be able to get in the driveway so it was a good thing I wasn't coming home right away. Wednesday found me back at Mon Ami for breakfast. I wandered in the casino and lost more money again first. Why not start the day that way lol!!! Because of the high winds, no seating was allowed on the patio. Many of the chairs were tipped over. They did start tipping them back upright after a bit. I really wanted a bit of a treat for breakfast vs. the 'better for me' or 'not as bad for me' crepe that I'd had a couple of days ago. I wasn't paying attention to the menu and ordered a bananas foster crepe. Oops that was a waffle. I knew if I was blowing some carbs I wanted it to be on the bananas foster part vs. a waffle lol. So I was about to change back to a different crepe when my server indicated it was no problem to do that on a crepe. When he keyed it into the micro he simply keyed a plain skinny crepe, likely with an 'ask me' code on it. No, I didn't eat all the whip creme, nor did I eat all of the crepe but I did finish the banana part! Actually overestimated a bit and had to grab a bottle of juice just before my Flaming Uncovered tour. Breakfast was spent texting and then calling with my hyper daughter who made it safely to MSP but was still worrying about that later flight. Decided to play a bit before I headed up the Strip. I went back to Tarzan & lost a chunk. The fellow next to me to the left on Buffalo Grand (?) hit a $5040 handpay. I then decided I would give Buffalo Gold a try. I lost $200 in that and the fellow to the left of me (dead serious here) hit a $1203 hand pay. I evidently had lost all of my luck and turned into a good luck charm for every other person there lol. The second fellow was from an Asian country, and spoke limited English. He didn't grasp that he had even hit a hand pay (he had one spin left on the machine with his bet amount!) and then was having issues understanding he needed to provide his passport as ID. He went and got a companions passport sitting a few machines away. They finally got it across to him that his jackpot would be waiting and he needed his own. There were a few more issues with his address and finally someone who was able to communicate more easily with him came and confirmed his info. They indicated that if he had a players card, they would have had his background info & it would have been a lot quicker. I was determined I was going nowhere near Buffalo again this trip & I did not. I had booked the Flamingo Uncovered tour so I headed up to the Garden Bar for the 1 pm tour. I was joined by a couple from Canada and Alex Degemetich, Experience Director as the guide. This experience was $49 plus tax - around $55 total. 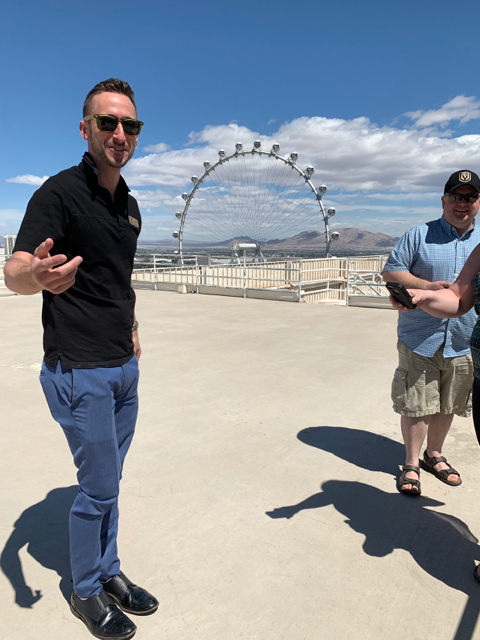 We started with the rooftop visit to the helipad area. I really think if the higher ups were aware of the severe wind speeds that day we would have not been allowed to do that portion lol. I was terrified and clutched the railing a good portion of the time up there. After that we visited Bugsy's Cabaret showroom and the Donny & Marie showroom. Then off to the kitchen area for a taste of Sticky Chicken (food truck venue inside Linq Sports Book) and then up to the bakery on 2nd floor for a Chocolate Chip cookie. Off through the Center Cut kitchen, and then out to the pool, gardens & Bugsy's memorial. A final stop at the wildlife area. The Go pool was actually closed because of the high winds also, but the family pool was open. Interesting tour. I never knew they had those types of things at the Flamingo. Do post if you take the mixology tour. Glad you got your flight rearranged! Excellent report!! Thanks for sharing it with us. I did bop over to Harrahs to eat supper in the Diamond Lounge. I unfortunately was a couple thousand short of 25,000 last year so I did need to use 1000 RCs for entry. And they definitely took it. 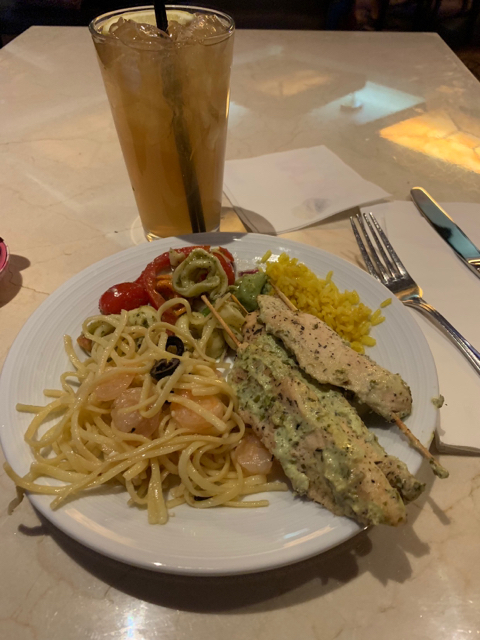 Supper was not really anything I was super interested in, but I grazed on a salad and some seasoned chicken skewers and had a nice LIIT to drink. I did manage to lose a ton when I got back to Paris and hit 1000 TC for the day. At that point I received notification from my daughter she had arrived safely. Thursday morning I decided to just do the BoB for the day. Weekday cost for a cardmember was $64.94 with tax. I enjoyed Paris buffet for breakfast. I love the crepe station although I was disappointed to see their default list of crepe selections was down to 4 (although you could edit it a bit). It was on chalkboard now so possibly more available on the weekend? Only one crepe cook but not a long wait at all. That line can be insane on a weekend. I didn't overeat so I could wander back in later for a lite lunch which I did quite late in the afternoon. I really ended up in moderate 'depressed because vacation is ending mood'. I was planning on going to the outlet mall, but just lazed around the slots. I intended to go to the pool, however the weather turned and was actually cold and windy. Consequently I skipped walking over to Bellagio also - never did make it to the conservatory! I was going 'down down down' when I had a few hits to win a small amount back on Sun & Moon. A couple of 50 game triggers (3 within an hour on 2 different machines) won back some of the days losses. However, I had already spent those beautiful wins from a couple of days ago. I did have an interruption for about 90 minutes with work issues and a page display. I used the Business Center because I couldn't bring up the appropriate display on my iPad. Rates for internet access are very high. I don't really recommend it although the facility was fine. I headed to Diamond check-in to inquire about any back-end comps. I only had about 3600 RCs left by that time and I knew they would use those first. What I did NOT realize was that they would also reduce any back end comps they were going to apply by that amount. (Does that make sense?). He offered $150 in back end comps. When the counter gal went to take it off, she indicated I had $36 in RCs. He said, oh you have to reduce the back end comps to $114 then. I thought it would be the amount they designated as back-end after whatever I had in RCs. Nope. So next time I will definitely burn all RCs before I walk in. (Previously I had just had them apply at end and normally most all was comped off). He indicated I should stop back in tomorrow morning if I played more and see if they could take more off. I did play another couple of hours that evening and earned about another 300 TCs - over 1000 for that day. So I did stop in the next morning but the hostess on duty indicated she couldn't do any more. I did question the considerably lesser amount with double the play over my November trip and asked if it was because of the high rates that week. She indicated it was because the room rates were overall higher so the comp room calculated was higher. So I did end up with about a $240 bill. Last evening supper was another BoB. I just went back to Paris because I had stuck my head out the door and discovered that it was COLD and WINDY lol. So much for Harrahs buffet! Supper was fine. Prime rib was a tad tough but had good flavor (I can't find any that is as good as what I get in Wisconsin out there). Friday morning - homeward bound. My husband said I was still not going to be able to get into the driveway because of the 'cement snow'. I actually felt very ill and stayed in bed until the last minute. Since I knew that Paris had a 'to-go' option on the buffet, I thought I could take a few items in a small container from my BoB and eat them at the airport. Well evidently not. If you are doing the 24 hour you CANNOT take a to-go container. They did finally agree to let me go and get a couple of muffins or rolls but would not even let me put those in a to-go container. I was given a couple of extra napkins to wrap them up in. That was seriously the worst experience I had the whole week - so my week went very well. In retrospect I imagine that people on BoB would possibly pack a to-go container and give it to someone else - then go back into another buffet and eat themselves? Only logic I can see in it. But I was not happy and will express my displeasure if I receive a survey from Paris (have received on from Cromwell, Flamingo & Harrahs I believe so far). So I did not get the value out of my pass that I expected but I did have a couple of small rolls to have with my coffee at the airport. VIP Shared Ride Shuttle was on time for return trip and very nice driver. Delta check-in was quite long. I accidentally went to the wrong gate (OOPS) but then found the appropriate one. While sitting there she paged for volunteers for a bump to the 6:20 flight (I was scheduled for 10:45 or 11:45? not sure which). Offer? $900...........yes, $900. I went to the desk but it turned out she was taking names at the gate. I did get my name on the list and YES I was accepted. Better yet, when she gave us our credit (5 people) she upped it to $1000. I took mine in the form of a Delta gift card (several options now - not just flight credit - Amazon, Best Buy?, AmEx GC w 6 mo expiration, etc). They email it to you and you have it in moments - have to use a number from a printed voucher they hand you to claim. Ate lunch at the 'diner' and read and relaxed. Did not even touch a slot at the airport (was really sick of playing lol). I saw a new small private lounge area that had just opened. What I didn't realize until a couple days after returning was that I actually had something that qualified me to have gone in there. Would have been a LOT better than sitting on the hard chairs. Live & learn! Evidently has food & beverages, comfy areas etc. I had contacted my shuttle when I bumped and changed it to the 1 am shuttle. That would have put me back to EC at 2:45 and then another hour to home. I didn't want to risk driving that tired so I called right before I boarded for the flight and rebooked for next morning. Grabbed a Fairfield Inn I've stayed at by the airport for $100 and had a good nights sleep! Medical emergency on flight on the way home. Young gal who was either dehydrated, drunk - something. Page for medical and plane actually slowed and turned directly towards Denver. However when there was a nurse on board we then straightened back towards MSP and kept going. They gave her an IV and she and her companions had to exit the plan before any of the rest of us so she could be checked by EMTS. I did have an awesome trip overall. I did not do everything I intended - even with an extra day, but hey no big deal. I lost more than I planned, but less than I had budgeted. So that was good. I am at 8703 in TC. I don't believe the 450 I should receive from paying $90 for the last night have posted yet, so hopefully will be slightly over 9000. Hoping my BFF & family will road trip to Council Bluffs or Joliet that I can tag along on. If not, then hopefully back to Vegas in November. I have a new grandbaby coming late September, a wedding in Texas in October and a work conference in San Diego in October. (Flights to SD from MSP are $$$$ for some reason - that Delta GC will be used towards that). I went to do my standard freeplay at our local Tribal casino Wednesday night. Did walk out $530 ahead which also put a nice dent back in my spend from this trip. Thanks to everyone that made it to the end of this! Great trip report. Loved following along. Thanks for posting.